Ends come before means. Before you decide how you are going to do a thing, you have to determine what it is you want to achieve. the means for achieving those ends are penultimate. The end is the important thing, everything else comes later. Before you design the first learning experience, you must define what it is the learner will be able to do at the end of it. We define the ends of instruction in terms of objectives. It is helpful to call them "performance" objectives because even if the performance is cognitive, it can be defined in terms of what the learner will do. Be creative here... An objective should describe the thing you will see if the learner has learned what you have taught. Objectives should contain a verb describing what it is the learner will actually do. When we describe the “givens” of an objective, we are talking about the circumstances in which the student will perform. This is important from two perspectives. First, an important part of any skill is knowing when to perform it. This "given" part of the objective helps clarify when the student will do this. Further, knowledge or skill doesn't exist in a vacuum, there must be a context for it. The "given" part of an objective describes this context for the performance. When you describe the givens of an objective, you are describing the conditions in which the student will perform the skill or need the knowledge. The New Bloom’s Taxonomy table accessible from the link below provides many examples of verbs that can be used in writing objectives. As we have said, an objective tells you when the student will perform an action. It will tell you what the action is. And it must also describe how well the student must perform it. That is, it must describe the required criteria for performance. This is the answer to the question: How well do the students have to do this thing? Criteria can be described in terms of a particular type of person’s judgment (e.g., a practicing physician) or it may be in terms of accuracy against some standard (e.g., 95% in 20 trials using the EVMS checklist for setting a bone). ...in accordance with EVMS standard procedures. ...as evaluated by a practicing physician. ...with 100% accuracy against the AMA standards. The following examples provide an idea of how to articulate the givens, the performance and the performance criteria for various types of objectives. Given a simulated compound fracture, set bone in accordance with course checklist with 97% accuracy. Given a service learning experience, map the health determinants ecosystem highlighting risk areas for the service learning recipients with 90% accuracy. Given 10 x-ray film frames, interpret the 10 images with 95% accuracy. Given a cadaver, identify the 15 dominant muscles in the lower back with 95% accuracy. Given a cadaver, create a process drawing of the healthy operation of a knee joint including all relevant bone structures and ligaments. 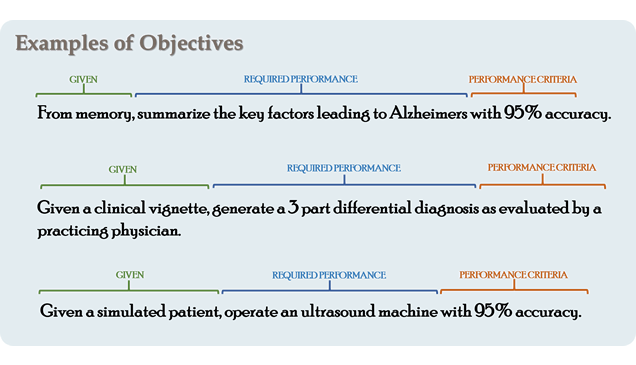 Given a detailed patient history, predict the probability that a patient will exhibit a prevalent family disease with 90% accuracy as measured against EVMS checklist standards. Given a post medical school survey, respond with agree or strongly agree to the statement: "I have grown in my respect for persons over the last four years." After having produced a differential diagnosis, defend the diagnosis before a panel of peers, as evaluated by a practicing physician. Given a complex clinical vignette and two minutes preparation, present a simplified summary of the medical situation to a simulated family member including 95% of the relevant details in plain language. Given a clinical vignette on a multiple choice exam, identify the steps for drawing blood for an A1C test with 100% accuracy. Given an accurate drawing, identify the four key muscular regions of the back with 100% accuracy. The New Bloom's Taxonomy provides a framework for classifying the types of knowledge our students will be learning, and also provides a structure for drafting the objectives. The table associated with the following hyperlink provides you with examples of phrases that you can use in creating objectives: Click here to view on overview of The New Bloom's Taxonomy with suggested verbs for use in writing objectives. Click on the red hypertext to view a printable pdf of New Bloom's Taxonomy. We prepared this rubric so that you could use it to evaluate your own objectives. Click here to view the Objectives Rubric. Affective performance is sometimes confusing. To the degree that we care about our graduates showing compassion or valuing certain things--to that degree--we are interested in affective objectives. These types of objectives focus on values, emotions, and choices. When we use the word "paradigm" in instructional goals, we are in the affective domain. Click here to view a simple affective taxonomy with affective objective verb suggestions. Click on the red hypertext to view a printable pdf of Affective Objectives. If you want to deepen your understanding of how objectives work, how they are related to instructional tactics, and how instructional media is related, you may be interested in this illustrative analogy we developed using Google Maps. Click here to view the analogy: Google Maps Example. This interactive model developed at Iowa State University's Center for Excellence in Learning and Teaching may help fill out your perspective on objectives. You mouse over part of the model and an example of an objective is presented. Click here to view the Iowa State model. Here is another example of a model that is used at Oregan State University: Click here to view the Oregan State University model. A great learning/performance objective dictates evaluation (See Assessment Section). Given sufficient case details, students will develop a good three-point differential diagnosis for each of 20 cases with 95% accuracy as judged by a practicing physician (Checklist Evaluation). A checklist that provides guidance to a practicing physician who will evaluate 20 differential diagnoses. The wording of the objective provides some latitude—the evaluation could be written or oral. The passing criteria would be 95% accuracy.